Get Up to $75 Rebate with New Flowmaster Offer! Looking to improve the performance and sound of your Chevy Corvette without huge expenses? 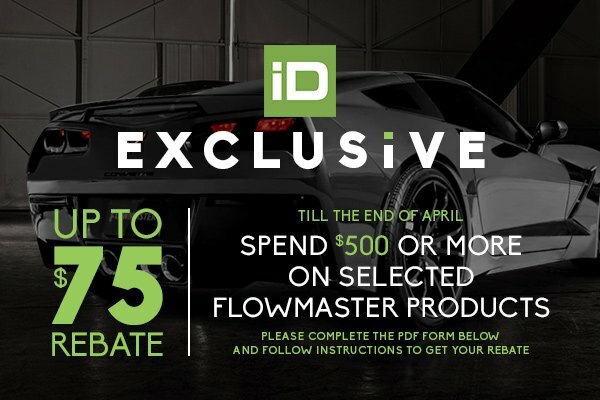 You have this chance with a new exclusive offer on Flowmaster products at CARiD! Right now you’ll get up $25 rebate with the purchase of Exhaust System, and/or Performance Air Intakes of $374.99 or less. Get a $50.00 rebate on a Flowmaster exhaust or air intake purchase between $375.00 and $499.99. Receive a $75.00 rebate on the orders of $500.00 or more. Don't hesitate too long, this offer expires on June 30, 2018. Flowmaster products are designed to deliver maximum performance combined with a stunning sound you've always wanted. Made from the top-quality 304 stainless steel they ensure excellent durability and a long-lasting service that you can rely on. Whether you want your ride to sound wild or mild Flowmaster has the right product for you. Please complete the PDF form and follow instructions to get your rebate.